Patricia Nakache is a general partner at Trinity Ventures. Editor’s note: Patricia Nakache is a partner at Trinity Ventures. She has active investments in companies including m-commerce players Care.com (CRCM), EAT Club, and ThredUP. Phil Carter is an associate at Trinity Ventures, where he focuses on early-stage consumer technology investments particularly in mobile-enabled marketplaces and services. No one can predict with perfect accuracy what technology trend will birth the next set of billion-dollar, venture-backed companies or “unicorns.” Even more difficult is determining where the next $100B+ “super unicorn” will come from, as history tells us this rare breed of company only emerges once or twice in a decade. Yet given that the last three U.S. super unicorns have all been consumer technology companies (Facebook, Google, and Amazon), and given that venture investment in consumer technology companies is increasingly dominated by mobile-first startups, it is reasonable to expect that smartphones will be the technology that unlocks the next $100B+ outcome. Here are two bolder predictions: By 2020, smartphones and tablets will account for more than 75 percent of global online commercial transactions and more than 50 percent of spend. And the world’s first mobile super unicorn won’t be an audience company like Facebook or Google, but a commerce company like Amazon. 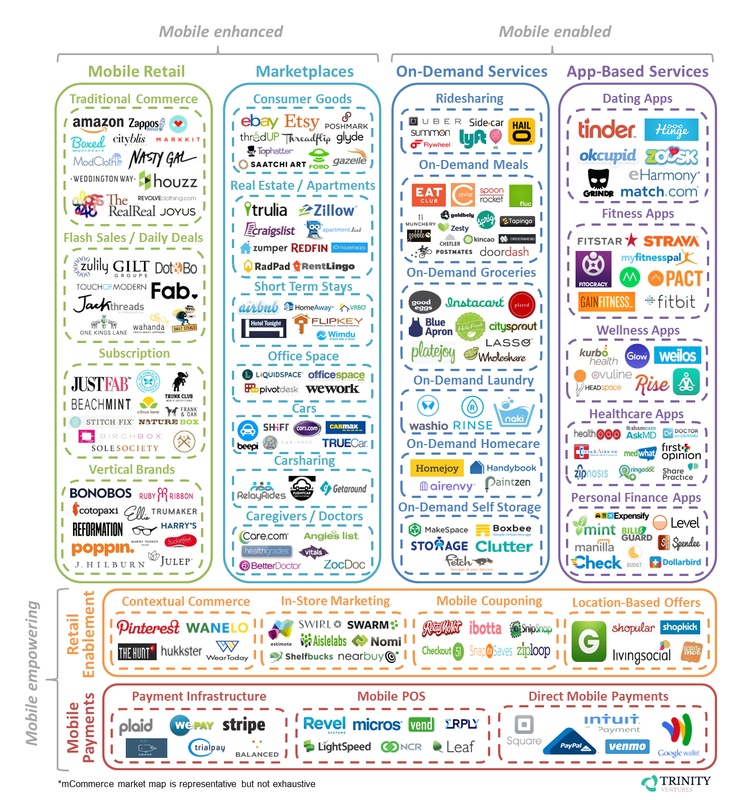 When tech historians look back on the 2010s, they will remember it as the m-commerce decade. For entrepreneurs eager to capitalize on the m-commerce opportunity, the first step is to understand the lay of the land. The m-commerce ecosystem falls into six primary categories: Mobile Payments, Retail Enablement, Mobile Retail, Marketplaces, On-Demand Services, and App-Based Services. The rise of m-commerce represents the most important wave of retail innovation since consumer brands first began selling goods and services online 20 years ago. Opportunities for entrepreneurs looking to build the next billion-dollar m-commerce company exist across all these categories, but are particularly concentrated in the relatively greenfield mobile enabled categories of On-Demand Services and App-Based Services. Companies in the Mobile Payments and Retail Enablement categories like Square and RetailMeNot capitalized early on the transition to mobile by building new businesses or reinventing old businesses to take advantage of growing merchant and consumer demand to conduct commerce on smartphones. Meanwhile, e-commerce companies like Zulily and Gilt that built their platforms as the mobile trend was gaining momentum exploited the opportunity to tailor new business models like daily deals around smartphones to gain a competitive advantage. In Q4 of 2013, Zulily generated 45 percent of its North American orders through mobile devices versus just 31 percent during Q4 the prior year. Only in the last 18 months have Uber and Lyft emerged as the first two unicorns in On-Demand Services, while the more nascent App-Based Services category has yet to generate a single unicorn outside of audience-driven mobile media apps, which we have excluded for the purposes of this discussion. Our bet is that the On-Demand and App-Based Services categories will spawn many unicorns, and other early stage venture investors appear to agree. Following Uber and Lyft’s success, venture capitalists have poured over $100M into a dozen meal and grocery delivery startups, including EAT Club, Munchery, Sprig, Caviar, SpoonRocket, Fluc, DoorDash, Postmates, Instacart, Blue Apron, Plated, and Good Eggs. Ridesharing and food services have been natural initial targets for substantial investment because they boast high-frequency use cases and are time-sensitive, meaning they benefit from mobile features like GPS tracking and real-time push notifications. Other on-demand subcategories are heating up, including house cleaning, laundry, and self storage. And App-Based Services are also seeing activity, with recent investments in fitness apps (FitStar, MyFitnessPal) and healthcare apps (HealthTap, Doctor on Demand). Mobile Payments. We define Mobile Payments companies as those that provide mobile payment infrastructure, mobile point of sale systems, and direct mobile payment solutions. This is a challenging space, characterized by razor-thin margins, large capital requirements to achieve scale, and fierce competition from credit card companies and PayPal. Successful entrepreneurs in this category must be good at accurately assessing credit risk. Given how difficult it is for payment companies to reach the scale required for an IPO, it’s also critical for entrepreneurs to keep M&A opportunities open to their companies as an exit option. One example of an exit in this category is the recent sale of Check (PageOnce) to Intuit for $360M. Retail Enablement. 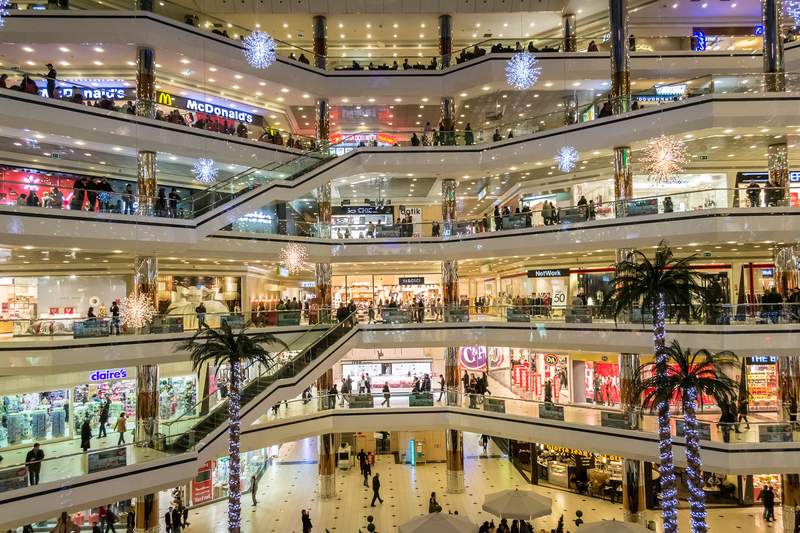 We define Retail Enablement companies as those that facilitate mobile-based retail transactions either by helping potential customers discover items they want to buy online (contextual commerce) or by helping them find offers offline (in-store marketing, mobile couponing, and location-based offers). Most of the companies in this category depend on location tracking and/or push notifications to present the right customer with the right offer in the right place at the right time. Winning is all about engaging with users intelligently to establish habit-forming behaviors without being intrusive or annoying. Mobile Retail. We define Mobile Retail companies as those that extend web-based retail platforms to mobile or build mobile apps to sell goods to customers through smartphones and tablets. In “E-Commerce is a Bear,” Bonobos CEO Andy Dunn argues that e-commerce startups have four survival strategies to compete against Amazon: proprietary selection, proprietary pricing, proprietary experience, and proprietary merchandise. All four strategies can be improved by leveraging advantages unique to mobile platforms. That being said, the current set of breakout companies are focused most on differentiated experiences. These companies are shifting the customer experience by embedding natural smartphone services such as picture taking and messaging. 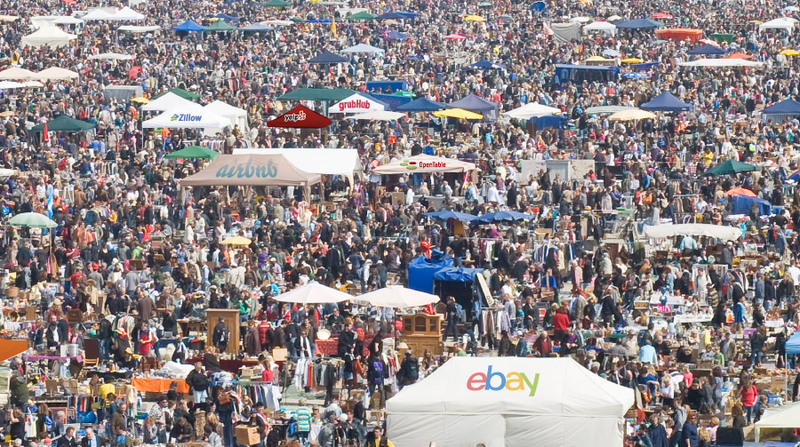 Marketplaces. We define Marketplace companies as those that facilitate transactions between buyers and sellers of goods or services either on mobile as an extension of web-based marketplaces or through a mobile app. The key to any marketplace is achieving liquidity, which companies can do more quickly by extending their marketplaces to mobile. Some marketplaces like HotelTonight and FOBO that involve local, time-sensitive or untethered transactions have gone mobile-only, recognizing their platform is fundamentally better on smartphones. Winning in this category is all about acquiring buyers and sellers cost-effectively and matching supply and demand efficiently to make transactions as frictionless as possible. On-Demand Services. We define On-Demand Service companies as those that provide services to buyers in a short timeframe either through vertical integration or aggregated supply. While many of these companies function as marketplaces, we place them in this category if they provide fulfillment on-demand (usually within minutes or hours) and/or provide real-time status updates to buyers. Smartphone features like location tracking and push notifications have only made these services possible in the last few years, which is why this category holds so much opportunity. Many On-Demand Services function as utilities. This means that winning in this category is all about price and convenience, both of which are driven by who has the most scale and the best algorithms governing vehicle dispatch, delivery routes, and fulfillment. App-Based Services. We define App-Based Service companies as those that provide services to customers entirely within a native mobile app. Given that users experience these services immersively on their smartphones, designing an intuitive user interface and seamless user experience can be the difference between success and failure. Entrepreneurs building apps in this category should emphasize accessibility, engagement, and retention. They should also take advantage of the digital nature of their products to conduct low-cost experiments, continuously refining their products to optimize their conversion funnel. Cumulatively, these optimizations translate into customer delight and more attractive economics. The rise of m-commerce represents the most important wave of retail innovation since consumer brands first began selling goods and services online 20 years ago. Given the size of the m-commerce opportunity, entrepreneurs who successfully execute on new mobile business models before the rest of the market stand to reap outsized returns. Especially exciting are new categories of consumer-facing businesses such as On-Demand and App-Based Services that could not exist prior to the smartphone – and are sure to spawn a stampede of new unicorns. We’d like to thank our colleagues Ajay Chopra and Gus Tai for their contributions to this article.